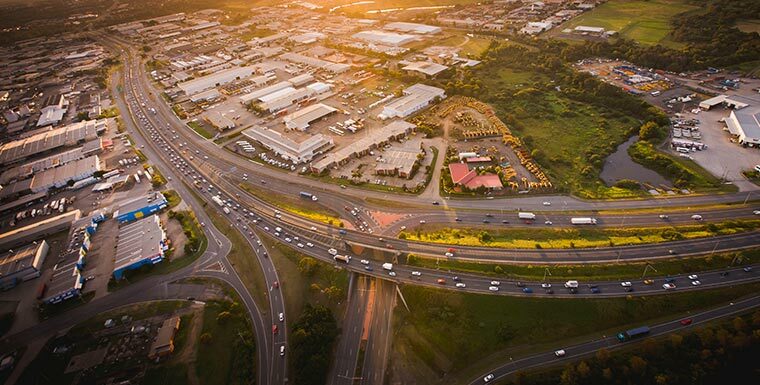 FSG are providing geotechnical expertise and completing the site assessment and detailed design for the Ipswich Motorway Upgrade project, as a key member of the successful D & C team. FSG’s efficient design solutions for the treatment of extensive soft soils was identified as being an integral reason for the project award. FSG is currently completing site investigation and detailed design for the project, which will result in the motorway widened from 4 to 6 lanes and include 12 new bridges. FSG will also be providing construction phase geotechnical support and onsite pile testing services. The project alignment has an extensive subsurface sequence of very soft estuarine and alluvial materials overlying very weak sedimentary rock. Due to the highly urbanised nature of the site, the provision of time and cost-effective embankment foundation solutions which allow the construction of the motorway widenings without excessive total and differential settlements is the key challenge of the project. Similarly, the management of the required construction sequence without significantly impacting the immediately adjacent live traffic is also a critical driver. The reference design identified a 3 – 4 year primary settlement period, whilst the project timeframe required delivery within 2 years. FSG re-evaluated the soft soil ground models and design assumptions incorporating historical data. This resulted in the segmentation of the site based on revised material compressibility properties and identified the Northern portion of the site as being significantly (~8x) more compressible than the Southern portion. This finding drove the construction sequence, by prioritising construction of the more compressible portion of the site to maximise surcharge timeframes and substantially reduce the duration of the construction program. Scoped and completed targeted site investigations – inclusive of CPTu, pore-press sure dissipation, DMT and Vane Shear testing – in order to verify the design consolidation Parameters and the extents of material over-consolidation. Site specific pre-loading trials with EPC instrumentation to verify load / settlement response.